ASTANA (KazInform) — CEO of Samruk-Kazyna National Welfare Fund of Kazakhstan Akhmetzhan Yessimov has introduced today Alik Aidarbayev as the Chairman of the Management Board of KazMunayGas (KMG) National Company. 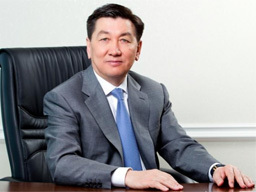 Alik Aidarbayev held senior positions at Yuzhkazneftegaz, Kumkol-LUKoil (later renamed as Turgai Petroleum), Mangistaumunaigas, and KazMunayGas National Company. Between 2011 and 2013, he headed KMG Exploration Production. He was the Governor of Mangistau region (2013-2017) and First vice Minister for Investment and Development of the Republic of Kazakhstan (March 2017-January 2018). Since January 15, 2018, Aidarbayev has served as Deputy Chairman of the Management Board of Samruk-Kazyna National Welfare Fund JSC.